There are four wonderful seasons here on the banks of Durbin Creek. 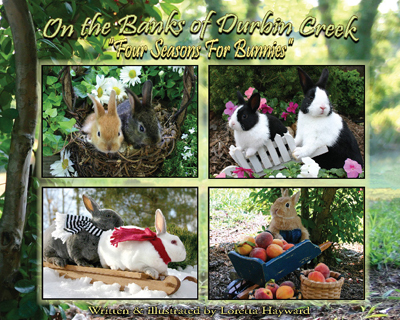 Here is a marvelous opportunity to meet many of our sweet rabbits through our extraordinary books written and illustrated by Loretta Hayward! Spectacular color photographs invite you into the scenes to enjoy close up views of bunnies in the garden settings. Learn more about springtime, summer, autumn and wintertime through the informative and amusing poems, stories and verses that the whole family will enjoy. The detailed pictures of the show rabbits born and raised at Garden Gates Rabbit Park are wonderful teaching illustrations. The footnotes identify the breed of rabbit pictured and the glossary included has many educational benefits that make this book a real asset to your home library. Our beautiful 8x10 glossy hardcover book has 52 pages. The series of "On the Banks of Durbin Creek" books are the finest quality printed in the US. Every page opens wide to exceptional full color close up scenes that make these books appealing to adults as well as children. "A thoroughly entertaining book that is an educational resource for all ages!" M Greene A friend and published author.